March 23, 2019 SEBS is returning Apalachicola, FL for a Fly-In Lunch! Our lunch will be at Owl Café in their Wine Room and will start at 11:30 am with a meet and greet. Lunch starts promptly at noon and ends by 2:30 pm. SEBS will provide transportation to and from the airport which is a short distance from town. Other options include renting a car from Enterprise via the FBO or hailing an Uber. check in with the FBO with your fuel order and your departure details. Take the SEBS van to town and explore! Enjoy this very walkable village. Following lunch, continue to explore town on your own. 2:30 - 4:30 pm: Returning shuttles back to the airport will run continuously with pickups in front of the Owl Café. There is no van service available on Friday or Sunday should you choose to make this trip a longer weekend. All participants must register online and pre-order their lunch choice by Sunday, March 10th; no walk-ins will be permitted. Shuttle van to/from the airport as noted on the itinerary. Registration is limited to the first 50 people that register due to space limitations in the dining room. Prices are all inclusive and include choice of one lunch item listed below: shareable table appetizer, American Blue Crab Dip with Flour Tortillas; choice of soft drink, ice tea, coffee or water; Appalachia cookie for desert; tax and gratuity. You will need to register yourself and each of your guests. Make sure you (and your guests) have reviewed the menu above and be ready to make selections for yourself and your guests. You will need to provide your expected ETA and tail number. First name, Last name, City and State - these items will be printed on name tags, so please make sure the information is correct. Email address - You will need to enter the email address for each of your guests. If you enter the email address, then your guest(s) will receive a copy of the event update that will be sent prior to the start of event. You may also leave the field blank. DO NOT enter your email address for each of your guests! If you do and have 3 guests, then you will receive 4 copies of every event update that is sent! SEBS members should login to their SEBS account prior to registering. Use your email address and password in the fields located in the top right-hand corner of this page. If you don't know your password, click the reset password link and follow the prompts. Click the Register button on this page. Then click the Add Guest Button at the bottom of the page to add a guest. Once all guests are added, click Next to continue and pay online. When your registration is complete, you will receive a confirmation email. Need help registering online or didn't receive your confirmation email? Contact Pete Grass at (859) 433-3329. Missed calls will be returned within 24 hours. Centric Aviation is providing a $0.20 per gallon discount off the regular rate, Facility fees of $15 will be waived for our group and Centric just encourages you to purchase fuel. Overnight parking is $15 for a single with one night waived with the purchase of 14 gallons or more. Slightly more for a twin. Other questions? Contact the FBO please. If you would like a rental car, please notify the FBO in advance for a reservation with Enterprise Rental Car. Please consider tipping your line staff for their parking and fuel assistance. 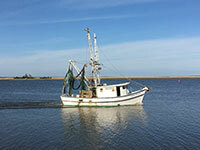 Apalachicola is a great place to visit and you may want to stay longer than our KAAF fly-in lunch allows. Consider staying in one of the several Inns, B&B’s or lodges in the town. (Be sure to watch for two night stay requirements at some properties.) Walking around town is fun, and you can soak up the panhandle ambiance and the sights of the forgotten coast. If you stay in that general vicinity, it is easy to get around and restaurants are within walking distance of the center of Apalachicola. Need a rental car? Contact Centric Aviation at (850) 290-8282 to make a car reservation prior to your arrival. If you have any questions about the fly-in, please contact Trip Captain, Pete Grass, at (859) 433-3329 (voice or text) or email communications@sebs.org. Cancellations received by Sunday, March 10, 2019 will incur a $5 cancellation fee per person. There will be no refunds for cancellations received after March 10, 2019 because of financial commitments for the lunch. Contact Pete Grass for cancellations.